Governor’s Hill is one of Columbia, South Carolinas most upscale communities located near the South Carolina Governor’s Mansion. Lying adjacent to downtown Columbia SC, this community places residents just minutes from the amenities of downtown living. Bordered by Richland Street, Assembly Street, Taylor Street, and Wayne Street, this community of approximately 95 residents overlooks the downtown areas most magnificent park, Finley Park with its mesmerizing fountain and large gassy area. And with Columbia’s central location in the State, as well as easy access to three primary interstate systems, I-26, I-20, and I-77, residents have easy access to numerous locations around the State, as well as to Georgia and North Carolina. This elegant upscale community provides residents with the benefits of a large subdivision without the distress of yard maintenance and long commutes. Homes in this neighborhood have the benefit of spacious rooms, multiple fireplaces, private courtyards, whirlpools, basements, and even in-law suites. Homes in this community range in value between $350,000 and $600,000 and range in size from 2500 square feet to 3250 square feet. This community is also gated enhancing the safety of the neighborhood during the evening hours. 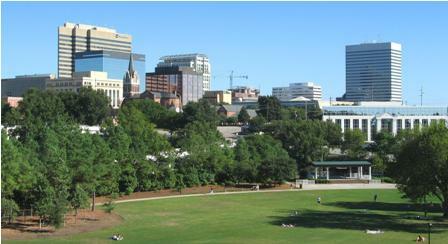 The Governor’s Hill community has the luxury of all the downtown amenities. Residents of this community have access to just about any type of eating establishment imaginable, to include the Blue Marlin, Ruth Chris, and Ristorante Divino. There are also numerous shops, such as the Mast General Store, and several museums, including the Columbia Museum of Art and the South Carolina State Museum. And Columbia has a large arts community providing residents with access to dance, vocal, and theatrical performances 12 months out of the year. Living on Governors Hill means never having a lack of something to do.